Can custom artwork be used instead of the artwork on an existing Paper Culture wedding suite design? Yes. With our free design assistance service, you can request to have your own artwork placed into the proof while still keeping the typography of the original design. Please note that you will need to have the rights to use the artwork you provide for printing purposes and cannot be copyrighted artwork. The artwork files should be 300 DPI and can be in jpg, png, pdf, eps, psd or ai files. Below are the steps to take to get your custom artwork placed into your proof. 1. 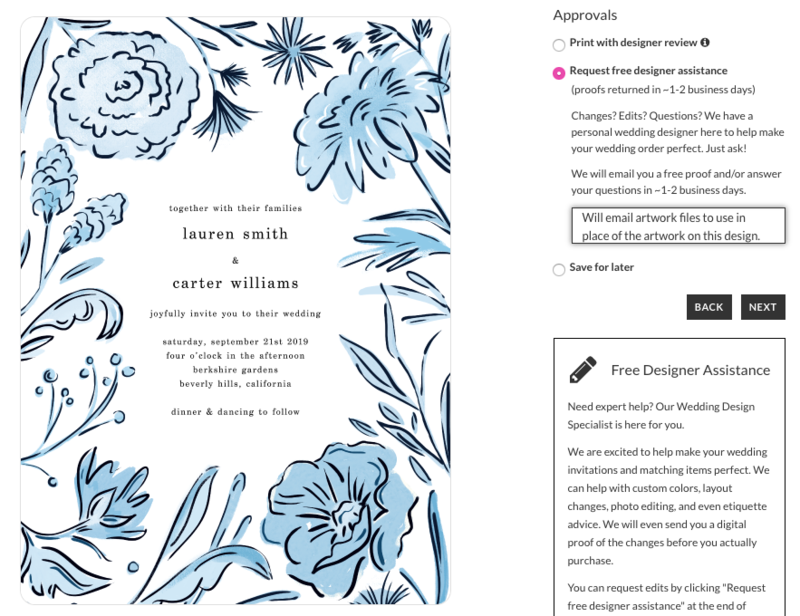 Personalize the invitation on the Paper Culture website as much as you can via Personalization. When you get to the Approvals page, select "Request free designer assistance." In the box provided, this is where you can write your edit requests to our designers. Make mention to our designers that you will be emailing your artwork files to be put into the proof. You can include any other design changes you want to make such as font changes, text color changes, and more. 2. 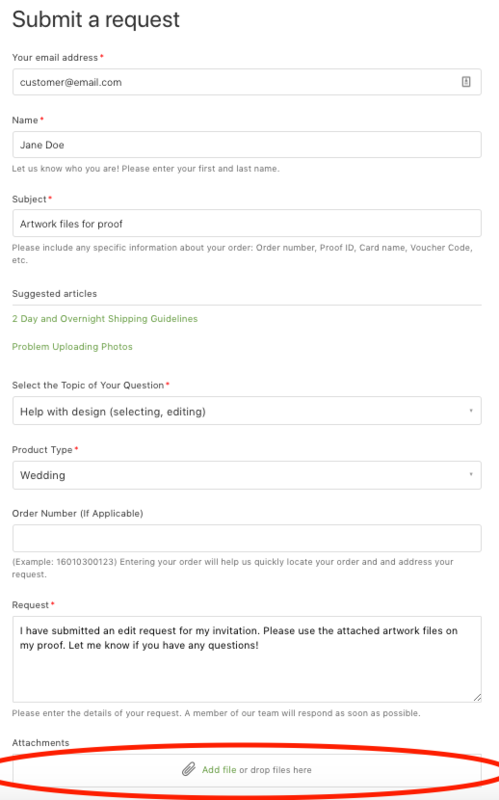 After you submit your edit request and choose your envelope options (you can change these at any time before checking out) you should see the card proof in your cart. The next step is to email the artwork files over. You can submit an email to us by going to our Request Form. You can make mention that you've submitted an edit request already for your proof and at the bottom of the form there's a button to attach your files. 3. After you've submitted the Request Ticket, you should receive an automated email confirming that we've received your email. A customer service representative will get back to you confirming that we've forwarded the artwork files to our designers. Once our designers have finished making the changes on your proof, you'll receive an email with a link to view your revised proof. From there, you can request additional edits or approve your proof.